Plants are insectivorous in situations where substrate acidity deprives them of nitrogen. To recruit some of the insect prey to help the feeding seems almost animal in its cunning. Only one of the 120 species of the Nepenthes genus has been found so far to use a single plant-ant species within its tissues to help out. Camponotus schitzi is the tenant ant while Nepenthes bicalcarata is the impressive myrmecotroph and insectivore. The plant is the largest species (although its pitchers are not) while the ant is smaller and less aggressive than the typical carpenter ant. To quantify what the ant provides is much more difficult than explaining how the ant receives a home, protection and food from the mutualism. What does this ant do for the plant? The domatium shown below is a tendril for this ant to live in and rear its larvae in safety. With an amazing diving and swimming ability only shown by this ant, the workers actually remove prey from the pitcher's trap, then dismember it so that the plant (as well as the ant) can feed. 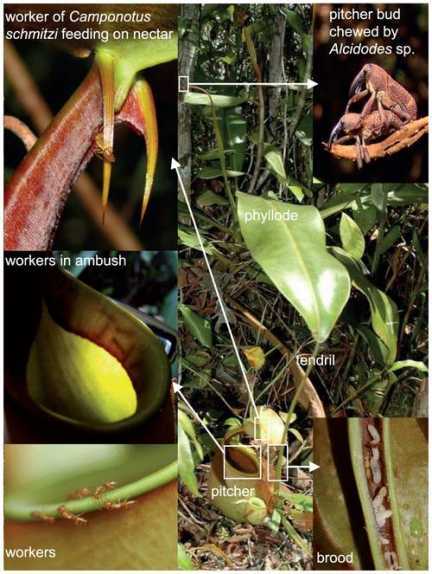 (Above image) A young Nepenthes bicalcarata showing leaf structure (photosynthetic phyllode, tendril and trap [here, the trap is a lower pitcher]). The upper left inset shows a worker of Camponotus schmitzi feeding on nectar from one of the two "fangs" ccharacterise N. bicalcarata. The middle left inset shows workers of C. schmitzi in ambush beneath the peristome. The lower insets show workers (left) and brood (right) of C. schmitzi, respectively, on the peristome and in the hollow and swollen apical part of the tendril, i.e. the domatium or "ant home." The upper right inset shows the Nepenthes-specific weevil, Alcidodes sp. copulating and feeding on a pitcher bud. The ants stay usually under the lip of the pitcher which is called the peristome ("around the stomach"), having eaten their fill of the catch, both waste food and their faeces drop as the precious nitrogen back into the soup of the trap. However there is more to this intimacy. The weevil shown in the authors' all-inclusive pic above is also unique to this type of plant. Weevils often remove buds from pitchers, preventing their proper functioning. The ants come to the rescue and attack the weevil as soon as it lands on the plant. Many plants of course have benefitted from ant protection in this way, providing similar structures to the Roman-sounding domatium in return for what is simply a protection racket. They also worked out that basically, the more ants there were, the larger the leaf area. In addition, the plants with ants had far fewer pitcher failures, which the authors call "abortions." It's obvious that this relationship improves this large plant's ability to produce (and also later to actually use) the pitchers efficiently. This is obvious when the pitcher volume and biomass of the prey is measured. The graph below shows just how positive it is for the Nepenthes when the ant is in residence. Prey consisted of other ants, termites, flies and beetles. (Above graph) Positive effect of Camponotus schmitzi on pitcher volume and prey biomass. 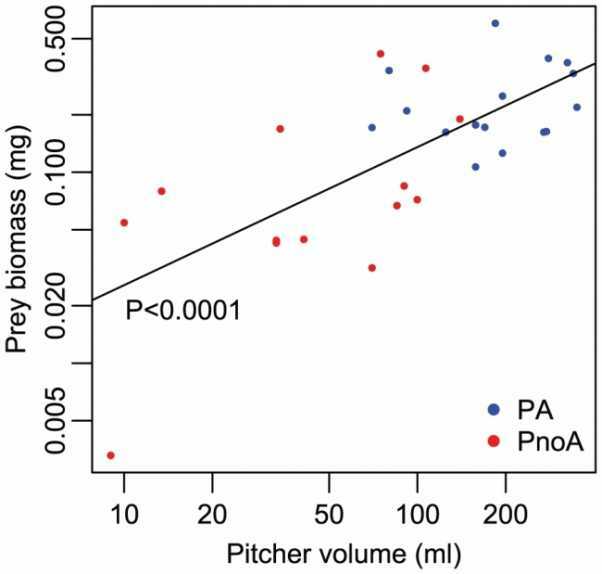 Prey biomass accumulated during the entire life of a lower pitcher as a function of pitcher volume (logarithmic scales). Blue and red points refer to PA (plant + ant) and P-A (no-ant plants), respectively. What happened to the nitrogen (protein) content of the prey? Very neatly investigated by the researchers, they found out that much more nitrogen was absorbed by PA plants. An unbelievable 42% of leaf nitrogen derived from the Camponotus ant mutualism, but this rose to 76% when more than 70% of the domatia were inhabited. An added extra benefit in this relationship would be that by removing large prey that would rot, the ant saves the essential fauna and flora of the soup in the pitcher, which is sometimes clean enough for frogs to breed in. It's needless to point out what the ant gets out of this. Unlike the plant, it is absolutely an obligate mutualist, which means it can't back out of the contract! It is possible that Camponotus simply chooses the healthiest plants, but the close relationship between photosynthetic area and ant occupation rate denies this argument its power. The intricate research about such mutualistic marvels simply proves this is truly a marriage made in heaven!